I am really happy with this purchase. The colors are just as pictured. The fabric is soft. Our new bedding looks great. In addition, the shipping was swift and we received our purchase as promised. 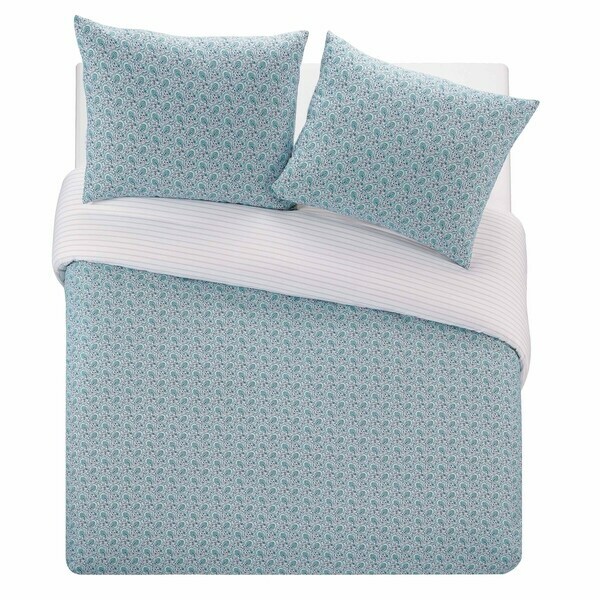 Let the WestPoint Home Tansley Duvet Set add fresh color and pattern to your bedroom décor. Made in trusted cotton, this multi-piece set offers a matching duvet cover and shams with two equally charming sides—the first boasts a grey and aqua floral print, which reverses to silver stripes on the back. Plus, each piece is well-crafted with clean, knife-edge hems and respective closures, like the duvet's five-button placket and a side envelope on the sham, that provide access for your favorite comforter insert or pillow (sold separately). The Tansley Duvet Set in Grey/Aqua is available in the following sizes: Twin (includes one duvet and one standard sham), Queen (one duvet, two standard shams), and King (one duvet, two king shams). I'm delighted with the color scheme of this duvet cover and it's 100% cotton. Looking forward to adding to our bedroom.